As we all know, superheroes don’t really exist. So when a genetic freak, a bizarre mutant giant was born in Italy, it became a serious national problem. Geovanni, who at the age of 16 measured 149 meters tall, frightened everybody. Normal people considered the boy an ungodly freak and a definite nuisance. For a while he worked in a traveling circus. But after he got tangled in the big tent, it became obvious that no sideshow could hold him. For one truly amazing season he played professional basketball, until finally injuring his back from stooping. The Pisa Chamber of Commerce finally had a brilliant idea. 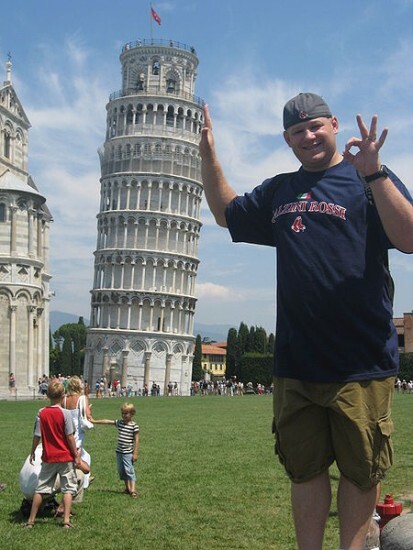 The Leaning Tower was at the point of tipping over. Instead of reinforcing the foundation, which would cost millions and take several years, they simply hired Geovanni. Tourists are now both perfectly safe and delighted! Previous PostSubway car rises like a sandworm from Dune.Next PostCross this inspirational bridge in the woods.